Click here to view the online video clip. For 20 years, Madeline W. Murphy held the national and Baltimore's local political leaders accountable to the African-American community through her column "A Little About A Lot" and other writings for the AFRO. Her straightforward characterizations of how the interests of our community were being impacted by the actions of both White and Black leaders was, during the 1970s and most of the 1980s, the bane of many politicians' existence. When Madeline focused her column's attention on a person, it could be characterized as a very public "private" kitchen conversation with your mother. No punches were pulled and no one was spared her "lectures" when she believed a leader needed to be "brought to task" on some unacceptable action. Madeline Wheeler Murphy was one of the brightest lights in Baltimore’s activist and writing communities. The 84 year old human rights advocate died recently, ending a life that was well lived. Mrs. Murphy married William H. Murphy Senior, member of the Murphy Family that owns the Baltimore Afro-American Newspapers who became a prominent attorney and later an outstanding member of the judiciary in Baltimore. She was a mother of five and an activist who never advocated for as cause without determination, passion and a combativeness that let all her opponents know that she was a force to be reckoned with in earnest. Madeline Murphy, the civil rights firebrand and AFRO journalist, perhaps best known for her take no prisoners, pull no punches delivery on the popular local television show, "Square Off", died of a massive heart attack this week at age 84. "She had a very attractive appearance, very articulate but, I never would have thought that underneath that appearance was a volcano," said former Baltimore mayor Thomas D'Alesandro, III during a television interview reflecting on when he first got to know Murphy when he was a City Councilman. That volcano beneath the attractive exterior would often erupt during tapings of the popular "Square Off" show in the '70s and 80s and one of Murphy's main adversaries was former educator Boyse Mosley who said, "She was just a grand lady." "Madeline was extremely intelligent, great sense of humor and dedicated to what she believed in. 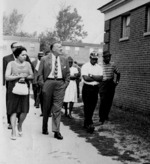 But, she respected other people's opinion and she respected mine although we didn't agree," added Mosley known as one of Baltimore's iron clad conservatives. "We would have our arguments on air and after the camera went off we'd look at each other and laugh," said Mosley with a chuckle. BALTIMORE (Map, News) - Madeline Wheeler Murphy, a prominent civil rights activist whose family was active in Baltimore politics, has died of a heart attack, her family said. She was 84. Murphy, who also was active in many civic organizations and causes, died Sunday at her residence in Roland Park. Murphy was the wife of District Judge William H. Murphy Sr. and the mother of five successful children including attorney William H. Murphy Jr., a former Circuit Court judge who ran for mayor in 1983. Born in Boston and raised in Wilmington, Del., she ran for City Council three times, was a longtime columnist for the Afro-American newspaper and appeared often on local television and radio shows, most notably, "Square Off" on WJZ-TV. Judge Robert M. Bell, chief judge of the Court of Appeals, told The (Baltimore) Sun that Murphy was an "outspoken" and "brilliant" woman who was a passionate advocate for progressive causes. Madeline Wheeler Murphy, 84, a prominent civil rights activist whose family was active in Baltimore politics, died of a heart attack July 8 at her home in the city's Roland Park area. Mrs. Murphy, who was born in Boston and raised in Wilmington, Del., ran for City Council three times, was a longtime columnist for the Afro-American newspaper and appeared often on local television and radio shows, most notably "Square Off" on WJZ-TV. "She was an activist type who was more prone to action than simply words," said Robert M. Bell, chief judge of Baltimore's Court of Appeals, who served on the bench with her husband, District Judge William H. Murphy Sr. "She wanted to get everybody inspired and to act in the best interests of this city. And she was not timid. She was a woman who did not fear to get into the male-dominated sectors." Her husband died in 2003. Survivors include five children, whose jobs include being a former Circuit Court judge, a political consultant, a former Washington director of the American Civil Liberties Union, a computer engineer, and a curator and former executive director of the Chicago Office of Fine Arts. (WJZ) BALTIMORE Hundreds came to the Tremont Grand to celebrate the life of community activist Madeline Murphy who died last week at the age of 84. As Richard Sher reports, the Murphy's grew up in the Cherry Hill section of Baltimore. Murphy's son Billy Murphy Jr. said, "Not a day went by when someone in need wouldn't knock on the door and ask for Madeline. She never said no." Former Baltimore Mayor Tommy D'Alesandro, III, said, "Madeline was the toughest fighter for civil rights I ever met and when she endorsed me for City Council President at a candidates' forum in Cherry Hill, I knew I didn't have to campaign there anymore." Madeline Murphy spent 60 years in community service, outspoken for those who needed a voice. Murphy died after suffering a heart attack. 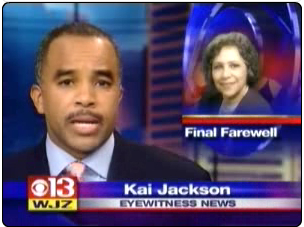 Click here to view the WJZ video segment on her memorial service.